In my fist was a single piece of candy wrapped in bright yellow cellophane, accompanied by an overwhelming feeling of guilt and sadness. I had just seen a little boy grab four: one for him, one each for mum and dad, and one for grandma, presumably back at home. There was a sign on the wall saying “Please Take One”, but it still didn’t feel right. In a corner of the contemporary art wing at the Art Institute of Chicago, sits sat a large pile of candy, wrapped in brightly coloured cellophane. 175 pounds of it, to match the body-weight of Ross Laycock before he contracted AIDS, dying eventually in 1991. 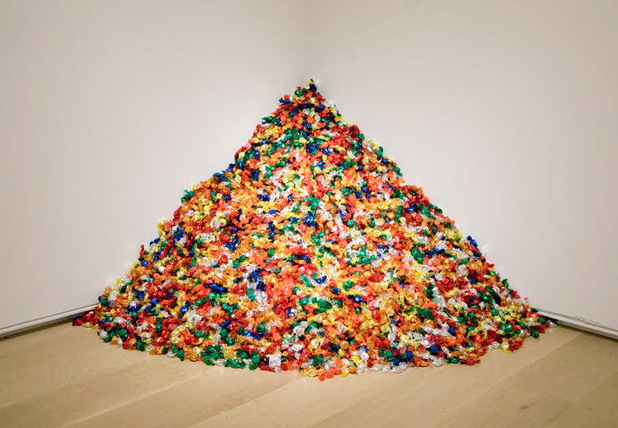 Ross was the boyfriend of the artist, Cuban-born American Félix González-Torres, and for this interactive work, “Untitled (Portrait of Ross in L.A.)”, Félix had given instructions for this exact amount of candy to be put on display in the gallery and consumed by visitors. The steady depletion of the sculpture would represent the deterioration of Ross’ body and weight-loss as the result of an AIDS-related illness. In effect, the viewers would partake in metaphorically re-enacting Ross’ death, which is why I felt so uncomfortable there, so complicit, and why I haven’t forgotten that moment more than one year on. The colourful shimmering pile of candy is to be replenished continuously, allowing Ross to live on eternally in a somewhat abstract sense. It’s a beautifully touching tribute and, since Félix himself died of AIDS in 1996, has transformed into a memorial of sorts to both artist and the original subject. The interactive installation contributes to a body of work from that decade that aimed to remove the stigma surrounding AIDS and its victims. That there should be any stigma at all always baffled me, but I was naïve, having experienced only relatively recently how bigotry continues to persist; works such as “Untitled (Portrait of Ross in L.A.)” are still necessary to inject some humanity back into humanity. This entry was posted in Art, Human Condition and tagged Contemporary, Death, Exhibitions, Social Justice, Travel on September 9, 2014 by Madhura Killedar.